Organizational Behavior: Theory and Practice covers the concepts of organizational behavior. 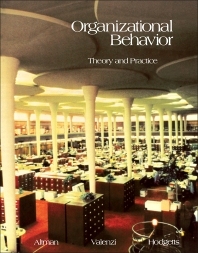 The book discusses the foundations of modern organizational behavior and the individual or group behavior in organizations. The text then describes organizational structure and the ways in which individuals, groups, and the structure all come together in an organizational setting. In this part of the book, major consideration is given to basic factors in organizational design, contingency factors in organizational design, and job design. The organizational processes used in bringing together the individual, the group, and the structure are also considered. The book further tackles the ways in which organizations deal with behavioral problems, such as conflict and the fears that often accompany change. Behavioral psychologists and students taking behavioral courses in management will find the text useful. Self-Feedback Exercise: What Do You Know About Human Behavior? Self-Feedback Exercise: How Effective Are You in Using Reinforcement Principles? Self-Feedback Exercise: What Type of Leader Are You? Self-Feedback Exercise: Are You a Left-Brain or a Right-Brain Hemisphere Person? Self-Feedback Exercise: What is Your Management Style?